I’m still on my ‘soup kick’……. Last week, I made my absolute favorite soup AGAIN (good thing Joe likes it a lot too!!!) and fortunately as is the case in summer, had garden beets to make it truly special. The taste, so superior to canned beets, which are a necessary ‘evil’ in winter . And the color, when fresh beets are available, the most amazing shade of deep crimson red. I’d actually like to make a sweater that shade LOL! Thanks Elaine for showing up with a bunch of fresh beets at just the right time! Luckily, I had all the other ingredients, ready to go in the fridge. I took the time to slightly pre-cook and then grate the beets, before adding them to the soup, as my mom and grandma always did.. Fresh garden dill, carrots, tomatoes, potatoes……it all added to the mix. A thick slice of rye bread, some vegan (or regular, if so inclined) sour cream for garnish and this makes a meal-in-a-bowl that really does satisfy the senses. I am including a link to the Really Natural post featuring this Borscht recipe and also Quickie Oatmeal Bread, both from NJFV. PSS Sept. 2013: I carefully reread this post at Really Natural today and this time noted several errors in the bread recipe. Molasses should be 1/4 C. , Warm water should be 1/2 C. , Rolled oats should be 3/4 C. and Sweetener should be sugar or honey, NOT brown sugar. If you have my cookbook, best to follow the instructions from there. There is one typo on that page though, yeast should be 2 teas. NOT 2 T.
Soup also has errors as listed there: should be 1/2 small cabbage and 1/2 pkg. of veggie pepperoni or ham. Wow, I should have read this over more carefully when first posted, I assumed the host of this site copied these recipes correctly from my cookbook, but didn’t. When I have time, I will repost this bread as it should be written. I’ve made this bread many times and it comes out beautifully! YUM! Borscht is one of my favorites! I rarely have it now that I don’t live in NYC anymore (My favorite was from Veselka on 2nd Ave., who also has very yummy pirogies too). I will have to try the recipe. Enjoy your beautitful soup, and the coming autumn! Oh geez. Too tired from the Cat Show to even think about making this, and I just don’t have fresh. Tonight will be lentil soup (don’t yell) from a can! But you know, it’s still decent with homemade (from the local baker) bread! That soup looks sooo delicious. Your food photos are enticing. Thanks for the link to the recipe and the oatmeal bread. That looks tasty! Never had beets before, but thanks to your soup, I may have to try it pretty soon. Hi Heather, Yummmm….nothing like borscht and perogies….killer calories but once in a while, what the hey (of course sauteed onions ON the perogies are part of the problem)…I also have my grandma’s recipe for perogies in NJFV but usually Im too lazy to make them LOL. They are just delic!!! Thanks for sharing some of your NY food memories! Hi JLB, Im sure your garden will be amazing, you definitely have a green thumb, Ive been checking in at your tree blog, love all the flower photos too. Make sure to plant lots of veggies and enjoy!!! Hi Nana and Meezer, As long as you two are cozied up together, that’s what’s important! I don’t think the Meezer or the Mitz care if we actually cook LOL. Hi Sheep, Its a bit cooler here too but still really nice. You must have some incredible colors on the trees, down your way. I love red maple leaves but none to be had, here on the Prairies. Hope you try and enjoy the borscht and stay warm. Hi MaryAnne, Thanks for the nice compliments! Its great having a digital camera to capture “foodie moments” LOL, when they happen. Hi Lynn, And welcome to Veggies. Yes, if you haven’t had borscht before, you are in for a treat. Its a staple here on the Canadian Prairies, if you like beets, you will LOVE borscht!!! I’m finally home. It was a great trip full of hiking and resting- wish I could go back now. You’re on a soup kick eh? I’m sure you know but Nava Atlas has a vegan soups book coming out this month. you should check it out! And thank you for your sweet words on my blog about my friend. It’s been a rough couple of weeks for me. 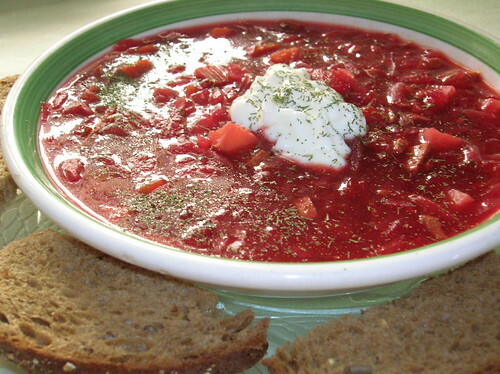 Love the borscht… makes me think of my grandma… i miss her so! Hi Teddy, Glad you are back home, safe and sound. Yes, I know about Nava’s new book. We are going to be reviewing each other’s cookbooks this fall, that will be fun! Nava’s got a big jump in the cookbook dept. (about 15-20 years I think). We’ve known each other for quite awhile and yes, I am looking forward to more great soups to try! BTW, I just added a review page to Veggies…today. Hi K, Thanks for the compliments. Hope you are feeling a bit better, this must have been a awful shock for you.